, a celebrated wit and physician in queen Anne’s reign, was the son of an episcopal clergyman of Scotland, nearly allied to the noble family of that name. 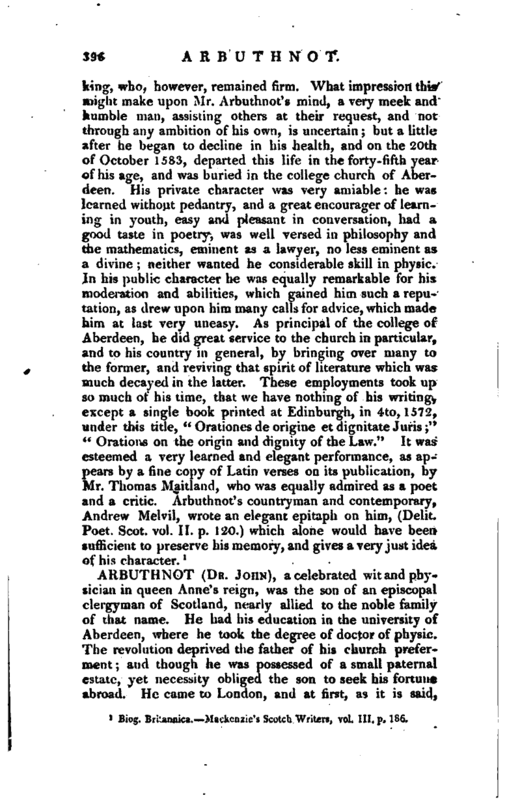 He had his education in the university of Aberdeen, where he took the degree of doctor of physic. The revolution deprived the father of his church preferment; and though he was possessed of a small paternal estate, vet necessity obliged the son to seek his fortune abroad. He came to London, and at first, as it is said, | for his support taught the mathematics. About this time, viz. 1695, Dr. Woodward’s “Essay towards a natural history of the Earth” was published, which contained such an account of the universal deluge, as our author thought inconsistent with truth: he therefore drew up a work, entitled “An examination of Dr. Woodward’s account of the Deluge, &c. with a comparison between Steno’s philosophy and the doctor’s, in the case of marine bodies dug up out of the earth, &c.” 1695, 8vo, which gave him no small share of literary fame. His extensive learning, and facetious and agreeable conversation, introduced him by degrees into practice, and he became eminent in his profession. Being at Epsom when prince George of Denmark was suddenly taken ill, he was called in to his assistance. His advice was successful, and his highness recovering, employed him always afterwards as his physician. In consequence of this, upon the indisposition of Dr. Hannes, he was appointed physician in ordinary to queen Anne, 1709, and admitted a fellow of the college, as he had been some years of the Royal Society. Dr. Warburton tells us, that the travels of Gulliver, the treatise of the Profound, of literary criticism on Virgil, and the memoirs of a Parish Clerk, are only so many detached parts and fragments of this work. The same writer declares, that polite letters never lost more than by the defeat of this scheme, in which each of this illustrious triumvirate would have found exercise for his own peculiar talent, besides constant employ merit for that they all had in common. Arbutbnot was skilled in every thing which related to science, Pope was master of the fine arts, and Swift excelled in the knowledge of the world: wit they had in equal measure, and that so large, that no age perhaps ever produced three men on whom nature had more bountifully bestowed it, or art brought it to higher perfection. See Warburlon’s notes to these. Memoirs. The queen’s death, and the disasters which fell upon his friends on that occasion, deeply affected our author’s spirits; and to divert his melancholy, he paid a visit to his brother, a banker at Paris. His stay there, however, was but very short; he returned to London, and having lost his former residence at St. James’s, took a house in Dover-street. In 1727, he published “Tables of ancient Coins, Weights, and Measures,” 4to. He continued to practise physic with good reputation, and diverted his leisure hours in writing papers of wit and humour. He contributed in 1732 towards detecting and punishing the scandalous frauds and abuses that had been carried on under the specious name of the “The Charitable Corporation.” The same year he published his “Essay concerning the nature of Aliments, the choice of them, &c.” which was followed the year alter by the “Effects of Air on Human Bodies.” He was apparently led to the subjects of these treatises by the consideration of his own case; an asthma, which gradually increasing with his years, became shortly after desperate and incurable. 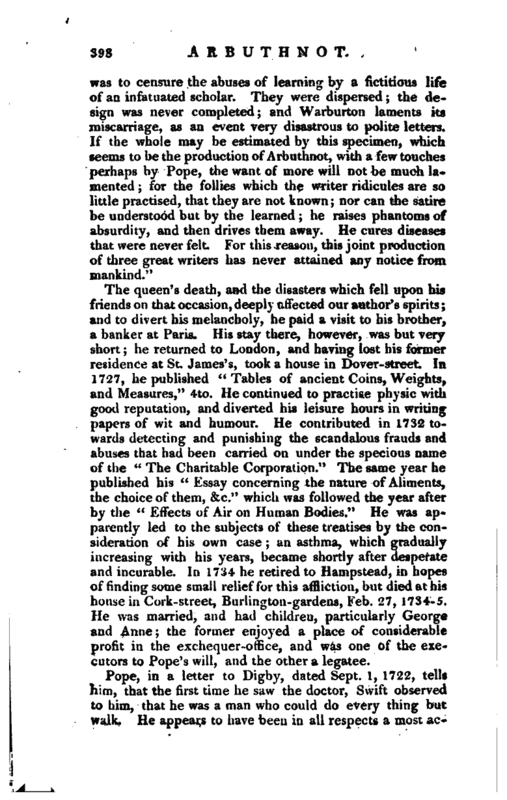 In 1734 he retired to Hampstead, in hopes of finding some small relief for this affliction, but died at his house in Cork-street, Burlington-gardens, Feb. 27, 1734-5. He was married, and had children, particularly George and Anne; the former enjoyed a place of considerable profit in the exchequer-office, and was one of the executors to Pope’s will, and the other a legatee. Biog. Brit. 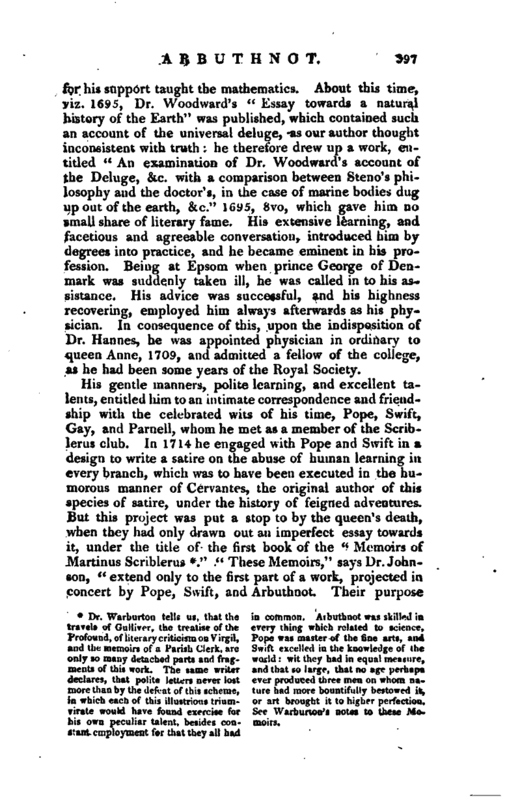 Swift’s Works, passim. See Index. Pope’s Works by Bowles. Forbi-s’s Life of Beattie. Tytler’s Life of Kaincs. 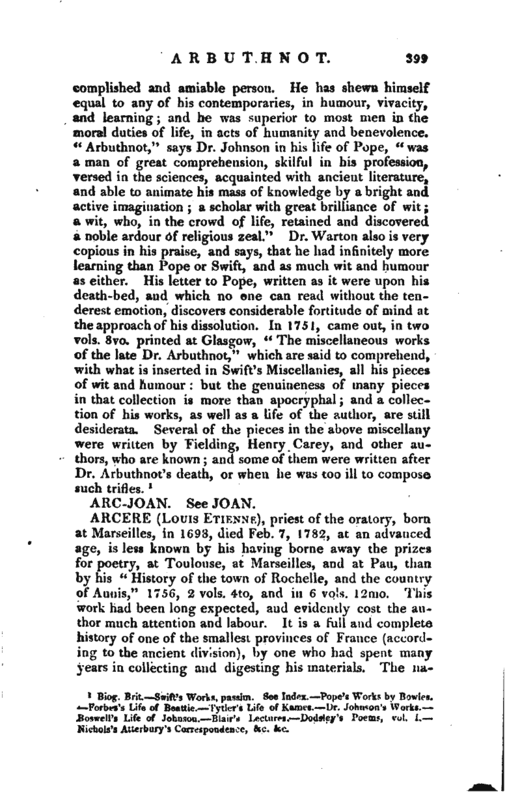 Dr. Johnson’s Works. —Boswell’s Life of Johnson. Blair’s Lectures.- Dodsley’s Poems, vol. I. Nichols’s Atterbury’s Convspondence, &c. &c.